Jesus did more miracles? He’s just full of miracles, isn’t he? I hope he does another food miracle. I’m getting hungry. No food this time? I need a cookie before we start then. On second thought, I need a bunch of cookies. Jesus saw a man who had been blind from birth. The Jews of Jesus’ day believed that physical problems were caused by sin and Jesus’ disciples asked Him if it had been the man or his parents who had sinned. I guess that’s why I have perfect health. I’m such a perfect dog. Being scared of thunder doesn’t count. Jesus said that neither had sinned. The man was blind so the work of God might be displayed in his life. Having said this, Jesus spit on the ground, made some mud with the saliva, and put it on the man’s eyes. I could do that with a slobbery kiss on that man’s eyes. “Go,” Jesus told the man, “wash in the pool of Siloam.” So the man went and washed, and came home seeing. I guess my slobbery kisses never made anyone see. Maybe I forgot the part about having to wash the slobber out again. The man’s neighbors who had seen him begging in the past weren’t sure if it was him, but he assured them he was the same man who had been blind. “How then were your eyes opened?” the neighbors demanded. 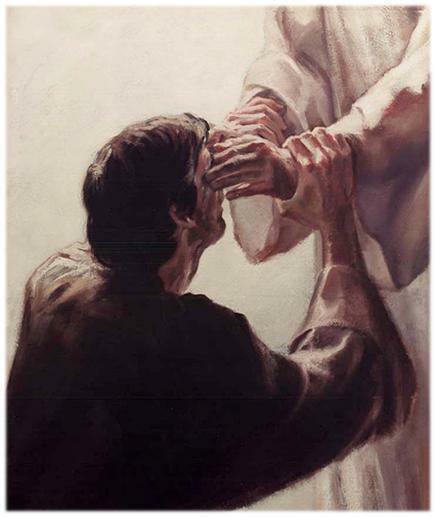 The man told them what had happened and that it was Jesus who had healed him. Then the neighbors took the man to the Pharisees who questioned him again. It might have been a lot easier for that man if he had just put everything on Facebook. The Jews still didn’t believe the man had been blind and received his sight so they talked to his parents. The parents were afraid the Jews would throw them out of the synagogue because they had threatened to do that to anyone who acknowledged that Jesus was the Christ, so they said they didn’t know how their son had been healed and to ask him. I think that guy wrote a famous song. I’ll listen, but can I bark along? This made the Jews really mad and they hurled insults at him saying they were disciples of Moses and they didn’t even know where Jesus came from. I know where Jesus came from. Can I go tell them? The Pharisees said, “How dare you lecture us!” and threw the man out. My eyes are shut. I can’t see a thing. Oh, wait. This is terrible. I don’t think I can do this. Do I have to walk around with my eyes closed until Jesus comes back? That’s going to be a long nap. Ah, but the pure hearted like you, are excluded, my dear Bongo! No worries! Thanks Marina. I was getting a bit worried. Thanks Chancy and Mumsy. My eyes are wide open now. I was having trouble keeping them closed anyway. Thanks Kevin. It really is a beautiful story. Thanks Little Binky. I can see again! Ginger, I think that might work. Lets go!